This installment of Tech Tracker looks at forthcoming enhancements to the Coca-Cola Freestyle, a touchscreen beverage dispenser used by thousands of foodservice operators around the country. Atlanta-based beverage giant Coca-Cola is testing a fourth-generation version of its groundbreaking touchscreen beverage dispenser. 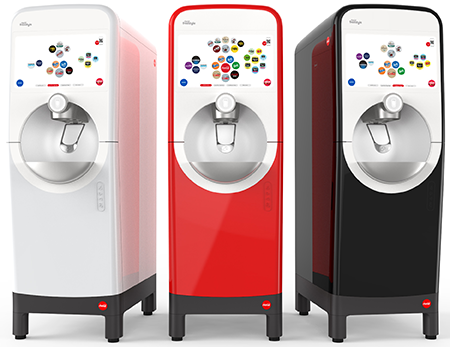 Dubbed Coca-Cola Freestyle 9100, this next-generation dispenser is being tested regionally with a national foodservice chain through the end of 2018. Freestyle 9100 will begin rolling out in 2019, the company said. Coca-Cola declined to reveal the test locations. The 9100 sports a larger, 24-inch high-definition screen, making it easier to select from more than 200 drink choices, which include roughly 117 low- or no-calorie options. It made its debut at the National Restaurant Association show in May. The machine is Bluetooth enabled so Freestyle app users can cue up their favorite drink or mix a custom beverage before walking into a restaurant. It also features greater ice capacity, a larger drip tray, and enhanced diagnostics to help employees monitor inventory levels. Freestyle 9100 also incorporates a new operating system that lets restaurants launch exclusive Freestyle beverages. Wendy’s and Zaxby’s, for example, used the programming to introduce drinks only available through the Freestyle dispensers. Wendy’s sold a special Dave’s Cherry Cream Soda, while Zaxby’s offered a limited-edition Sprite-and-Mello Yello mix at the University of Georgia and Georgia Tech during the college football season last year. The first Freestyle machines debuted in 2009 at quick-service chains like San Diego-based Jack in the Box. Today, roughly 50,000 dispensers located in restaurants, movie theaters, convenience stores, entertainment venues, and theme parks pour 14 million drinks per day. Beyond early adopter Jack in the Box, other brands using Freestyle include McDonald’s, Popeyes Louisiana Kitchen, Five Guys Burgers and Fries, Moe’s Southwest Grill, Denny’s, White Castle, Burger King, Pei Wei, Togo’s, Burgerim and Jimboy’s Tacos. Several Southern California independent restaurants also use the Freestyle, including Clifton’s Cafeteria in Los Angeles; TLT Food in Irvine; Saint Marc in Huntington Beach; and Splitsville restaurant and bowling alley at Downtown Disney in the Disneyland Resort. Have a tip on new restaurant tech? Contact Nancy Luna at [email protected]. Follow her on Twitter @FastFoodMaven.